The Miller's Daughter: Sew Happy! Today I'm here to show you the last card I made for Copic Marker Spain. And remember that we run a montly challenge and the theme this month is Anything Goes with Copic. 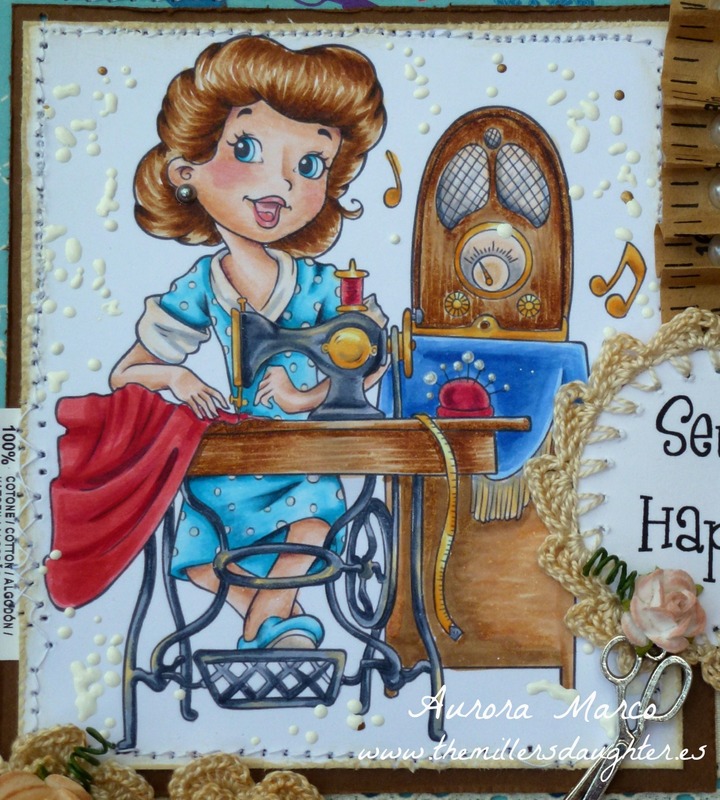 In this card: Digital stamp by The Paper Shelter, Vintage Seamstress. Patterned papers free with magazine, plain white and browns card. Distress inks (Tea Die and Antique Linen). Lace, ribbon, normal and fantasy buttons, scissors charm, paper measuring tape, flat back pearls, paper flowers, sewing pins and clothes tag. Hand made crochet flowers and sentiment. DT Favourite at ¨Love to Scrap! A wonderful card. Fabby colouring and great use of the TPS image. Love your fantastic card. All your details are fantastic. Really lovely! Thanks for playing with us over at the Paper Shelter this week. Amazing details and design, Aurora! Another beautiful creation with great details. Love the colours and embellishments. All the elements work so well together. It is perfect for our 14th ‘ANYTHING GOES’ challenge. Thanks for sharing your talent with us. Good luck. EXCELLENT!!!! woaaaa your coloring is Fabulous!!! loook at the hair! and the nose!! and i loooove the embellies you've added!! this is so creative!! Wonderful coloring and you have succeeded with fine details and a nice layout !! Thank you for participating in the TPS challenge this week !! Wow this is gorgeous and I love all the sewing embellishments you used. Thanks for joining in the Paper Shelter Challenge this time and for using one of our digis. Wow beautiful. Love that you crochet the sentiment. I can see why it would be a favorite. Thanks so much for joining us this week at Artistic Inspirations for your favorite of 2014!